Who wants to Read the Nobels? A new-old reading challenge! Sometime in 2007, when the book blogging world was still oh-so-new, I started up a perpetual reading challenge called Read the Nobels. I blame it on Gabriel García Márquez, whose 100 Years of Solitude convinced me that I needed to read more of his work. I learned he was Nobel Prize Laureate for Literature and decided that more wonderful authors were to be discovered. And so I did. Some of my memorable reads include José Saramago, Nadine Gordimer, J.M. Coetzee, John Steinbeck and Orhan Pamuk. I admit I may never have picked up many of these books if not for the challenge. In the same breath, I may have easily unknowingly read a book authored by a Nobel Prize Laureate! Hence the challenge Read the Nobels, which encourages readers to read books authored by those who have won the Nobel Prize for Literature. Over the years, the blog has seen many contributors coming and going. The best thing is that the blog remains a wonderful resource for book lovers alike. I've joined many reading challenges but regret not sticking to this one. I want to spread the world about this challenge and encourage you to get Nobel Prize-winning literature in your To Be Read lists for 2016! By breaking down the perpetual challenge to an annual one, hopefully you'll decide to join in. 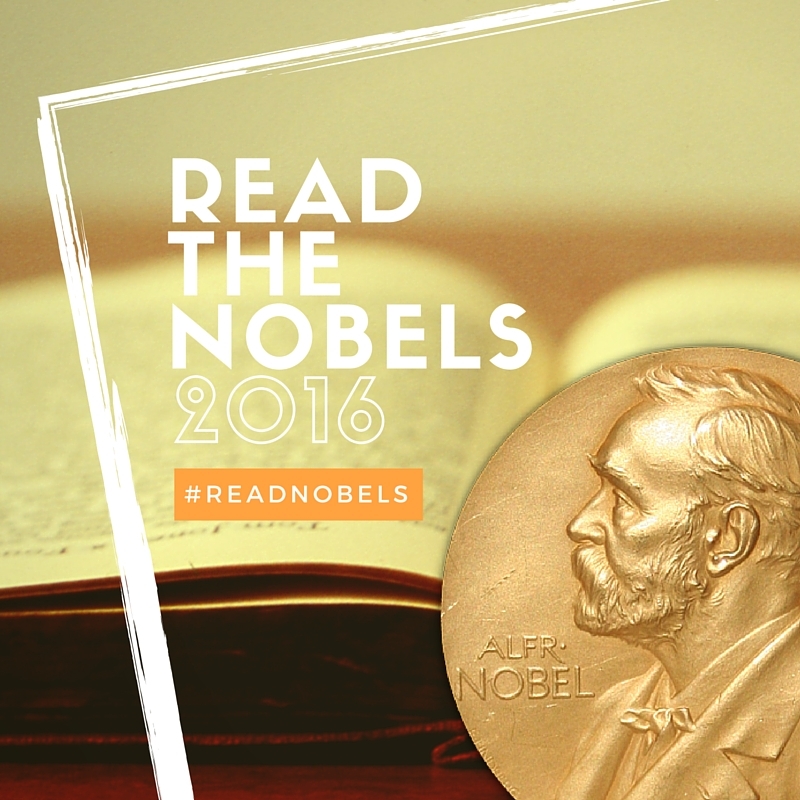 And so ... in this new year, welcome to the first ever edition of the annual reading challenge Read the Nobels 2016! I'd love it if you can join me! 1. Pick one of the reading levels below. Decide how many books authored by a Nobel Prize Laureate for Literature you want to read in 2016. 2. Grab the challenge button and write a post. Make sure you show your support and help spread the word by including the challenge button in your posts. You can also add the button in your sidebar. 4. Each time you read and review a book, provide a link back to this challenge page. After you read each book for the challenge, come back here and tell us about it! Provide a link to your review or post using the Google form at the end of this post. I will routinely update the official list of books reviewed by participants and feature them here at Guiltless Reading as well as on the Read the Nobels blog. When sharing your reviews or discussing this challenge on Twitter, use the hashtag #ReadNobels and/or tag @readnobels. Have you completed your challenge? Tell the world about your success and submit a link to your post in the form below. I will wrap everything up in January 2017! The challenge runs from January 1 through December 31, 2016. Feel free to join in any time during the year. Crossing over with other challenges is highly encouraged! Feel free to go through the various reviews and links already posted on the Read the Nobels blog. P.S. There is a version of this post on the Read the Nobels blog so you'll also be access the link and form from there.